Most boaters regard their boats as a welcome escape from everyday lives, sanctuaries from the extreme partisanship and anger swirling around us. Many of us have also created networks of close friends centered on our boats and marinas. But what happens when those networks start to fragment and that once-strong sense of community suddenly seems fragile? If your marina is anything like mine, there’s been enormous turnover this year, as people move in and out of boating, buy larger or smaller boats requiring new slips or relocate far away. For me that’s meant the loss of several dockside neighbors whose friendships I’d come to rely on. That’s led me to ponder how to rebuild a much-cherished sense of community in an increasingly transient and unsettled world and to ask: what are good ways to meet new people and develop fresh relationships? Stop and talk to newcomers. Most boaters, whatever boat they own, are usually happy to talk about their boat, their cruising experiences, their fishing successes and failures and maintenance and repair projects and upgrades. Arv and I enjoy building camaraderie over sea stories and drinks on our boat or nearby restaurants. Be neighborly. If you see someone approaching their slip in clear need of help with lines, offer a hand. When we first brought our current boat, with its high freeboard, into our marina we wondered how we’d manage to secure our lines. Fortunately, neighbors saw our dilemma and volunteered to help. They later became special friends. When it comes to maintenance and repair issues, be willing to assist fellow boaters by sharing recommendations of reputable, competent mechanics, boating supply sources and other specialized vendors, along with warnings about bad actors and incompetent crooks. Sometimes the timely loan (and return) of a suddenly-needed tool can make all the difference to cementing a friendship. Another great way to bond with people is through their dogs. While most of our dockmates met our cats only through our pilothouse windows, our neighbors regularly walk their dogs. Chatting with them about their charming and sometimes silly dogs is a wonderful icebreaker. I’ve made many good friends through our mutual love of animals. Children and grandchildren also are terrific “connectors,” stimulating easy conversations over kids’ interests, activities and antics. 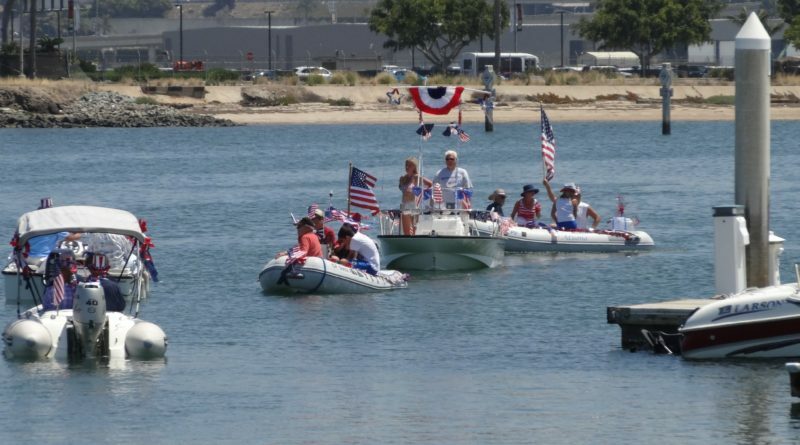 Many marinas throw periodic parties, barbecues, mixers and other meeting opportunities. Chula Vista Marina, in San Diego’s South Bay, takes their community-building several steps further. Aware that many of Chula Vista Marina’s tenants are newbie boaters or new arrivals to the area, Dockmaster Mike Sullivan places a premium on helping slip holders build skills, scheduling twice weekly classes and workshops on diverse subjects including boating safety, navigation and charts, celestial navigation, knots, weather, long-range cruising and maintenance and repairs. In the summer season Chula Vista stages monthly social events and parties, often with bands, and on the Fourth of July a parade with children’s activities. If your marina doesn’t offer parties or mixers, consider starting a hospitality committee and organizing potlucks, weekend coffee and doughnut gatherings or other social events to get to know fellow boaters. If a marina-wide potluck isn’t workable, try recruiting your neighbors for a get-together along your dock. But respect that some boaters use their vessel as a refuge from life’s stresses and prefer not to socialize. Many boaters have wide cruising experience and sea stories they’re happy to share with others. Try arranging occasional presentations where boaters can share tales of their marine adventures with fellow marina tenants. With a little creativity and willingness to initiate and organize activities, we can all build or rebuild our boating community’s sense of togetherness.